Who doesn’t like free money? Apple is offering some of that today in a special limited offer that started on Monday and ends on Thursday, December 20. 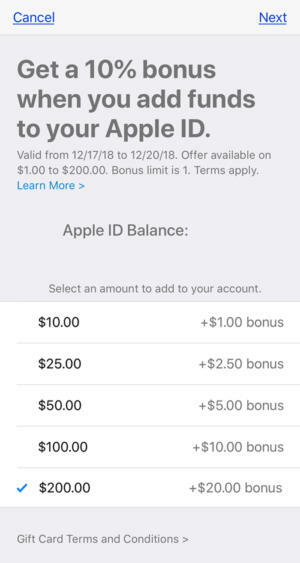 Apple’s promotion is a 10 percent bonus when you add funds to your Apple ID. For example, if you add $10, Apple chips in $1. The limit is $200, where you get a bonus $20. 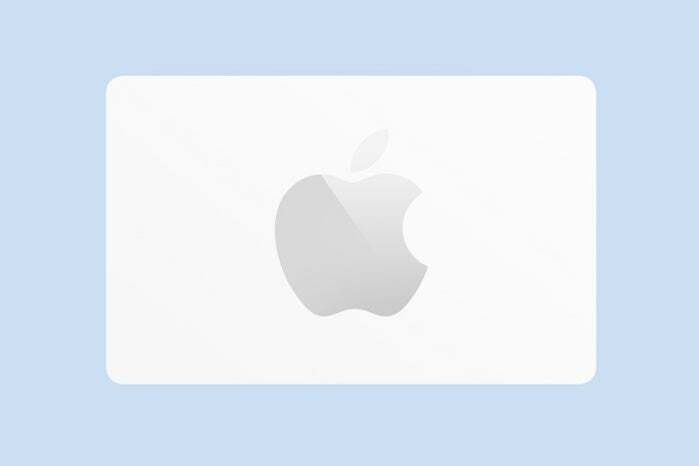 The funds in your Apple ID can be used on the iOS and Mac App Store, and the iTunes Store. You can also use the funds towards iCloud Storage. Funds cannot be used in the online Apple Store. This offer can be performed only once per customer. Here’s how to add funds to your Apple ID, using an iPhone or iPad on iOS 12. Tap the section with your name at the top of the listing. Tap your Apple ID at the top of the listing. An Apple ID pop-up should appear. Tap View Apple ID. You should now be at Account Settings. Tap Add Funds to Apple ID. You can tap any of the amounts in the listing. If you want add an amount not listed, tap Other and you can enter in the amount. The bonus will be calculated after you enter an amount. Tap Next at the top when you are ready to proceed. You should be at the confirmation screen. You’ll have to confirm the process by pressing the power button on your iOS device twice. You can also cancel. Here’s how to add funds to your Apple ID through the App Store, using a Mac on macOS Mojave. Launch the App Store app (located in the Applications folder if it’s not in your Dock). Press Command-0 or click Store > View My Account or click on your name at the bottom of the left column of the app. Click View Information at the top right of the app. Your Account Information should load and appear in a pop-up window. In the Apple ID Account section, tap Add Funds to Apple ID. Tap Next at the lower right when you are ready to proceed. Here’s how to add funds to your Apple ID through iTunes, using a Mac on macOS Mojave. Launch iTunes (located in the Applications folder if it’s not in your Dock). Click Account > View My Account. If you are not logged in, you’ll need to do that first.